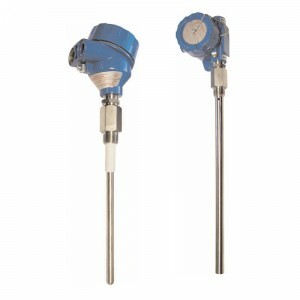 Intempco LTX20 Series two-wire RF level transmitter provides highly reliable, low cost level indication and control that is suitable for all liquid level applications that do not leave a severe build-up on the sensing element. LTX20 transmitter measures the change in capacitance that occurs as the tank level changes, and outputs a standard loop-powered 4-20mA signal. It uses a very high frequency, very low amplitude sensing circuitry to greatly minimize the effects of coating on the sensing probe. LTX20 is available as an integrally mounted package. A number of level sensing probes can be selected based on the application including bare stainless steel probe, rigid FEP coated probe and rigid concentric. Available housings are aluminum and stainless steel NEMA 4X.